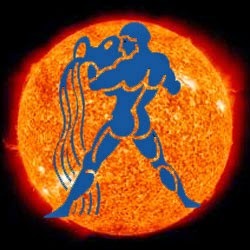 AstroSage Magazine: Sun In Aquarius - How Much Auspicious Sun Transit In Aquarius Is? Sun In Aquarius - How Much Auspicious Sun Transit In Aquarius Is? On February 13, 2015, Sun will transit in sign Aquarius. How your fate is connected with this transit? How will it affect your zodiac sign? Know impact of Sun transit in Aquarius from ‘’Acharya Raman’’. Read Sun Transit In Aquarius (February 13, 2015) Effects Now! On February 13, 2015, Sun will transit in the second sign of Saturn, i.e. Aquarius. In Aquarius, the three constellations of Mars, Rahu and Jupiter named Dhanishta, Shatabhisha and Purva-Bhadrapada remain in series. Sun transit is considered very important. Hindu months and many festivals are based on the transit of Sun in different constellations. Sun transit has a great importance in one of the most accurate astrological technique that is Krishnamurti Paddhati (KP). In a day, Sun covers a distance of one degree. For this reason, it stays in a zodiac sign for one month only. Read the effects of Sun transit in Aquarius in detail by clicking on the provided links.